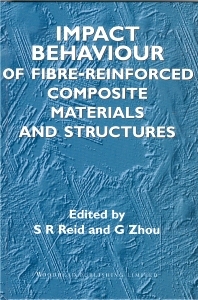 Impact behaviour of fibre-reinforced composites; Recent developments in impact damage assessment of fibre composites; Modelling impact of composite structures using small specimens; Impact damage – tolerant composite structural design; Damage resistance and tolerance of thick laminated woven roving GFRP plates subjected to low-velocity impact; Elastic impact stress analysis of composite plates and cylinders; Impact behaviour and analysis of CFRP laminated plates; Perforation of FRP laminates and sandwich panels subjected to missile impact; High velocity impact damage to polymer matrix composites. S. R. Reid is the Conoco Professor of Mechanical Engineering at the University of Manchester Institute of Science and Technology (UMIST). Dr Gang Zhou is Lecturer in the Department of Aeronautical and Automotive Engineering at Loughborough University.